References to Kambojas abound in ancient literature, and this may have been just the expansion of an Indo-Iranians|Indo-Iranian tribe with both Persians|Persian and Indic affinities from their homeland in the Afghanistan-Turkistan region along the foothills of the Himalayas towards Bengal, along the coast to Gujarat, to Sri Lanka, and possibly further to Cambodia. During second/first century BCE, in their advance from their original home in Central Asia, one stream of the Kambojas, allied with the Sakas and Pahlavas had proceeded to Sindhu, Sauvira and Saurashtra|Surastra; while the other stream allied with Yavanas appears to have moved to Punjab region|Punjab and Uttar Pradesh. There is a distinct prophecy|prophetic statement in the Mahabharata that the Mlechcha (Barbaric) kings of the Sakas, Yavanas, Kambojas, Bahlikas, Abhiras etc will rule unrighteously in Kaliyuga (MBH 23/187/28-30). According to Dr H. C. Ray Chaudhury, this is too clear a statement to be ignored or explained away. Image:DemetriusCoin.jpg|right|thumb|300px|Silver coin depicting the "Yavana" Greco-Bactrian king Demetrius I of Bactria (r.c. 205-171 BCE), invader of India around 180 BCE. Obv. Draped and wearing an elephant scalp, symbol of his conquest of India. Rev. Youthful, naked Heracles, crowning himself with right hand, with lion skin and upright club resting on his left arm. Greek legend: BASILEOS DIMITRIOU "King Demetrius". This statement, couched in the form of prophecy in true puranic style, alludes to a historical situation (second/first century BCE downwards) which followed the collapse of Maurya and Sunga dynasties in North India. The invading hordes of the Sakas, Yavanas, Kambojas, Pahlavas, Abhiras etc from the north-west had entered Punjab, United Province, Sindhu, Rajasthan and Gujarat in large numbers, wrested political control of northern India from the Indo-Aryans and had established their respective kingdoms/principalities in the land of the Indo-Aryans. Though the Kambojas are not specifically mentioned in this passage, it goes without saying that the term Yavanas in Yuga-Purana defintely included the Kambojas and probably also the Sakas. It is notable that after massive intrusion of India by Sakas, Kambojas, Yavanas, Pahlavas around Christian era, the term Yavana had also become synonymous with Barbarian|Mlechcha and was a common designation for all foreign tribes irrespective of whether they were Yavanas, Sakas, Kambojas or others (See: Hellinsm in Ancient India, pp 19-20, Dr G. N. Banerjee; Williams-Monier Sanskrit-English Dictionary). Passages exist in the Mahabharata, Vayu Purana (I/58/81-83, II/37/106-09) and Matasya Purana (144/51-58) which include the Kambojas among the Yavanas and designate both as Yavanas. There is another reason for this too. The culture of the Kambojas had been substantively altered due to their intimate contacts with the Yavanas. Both people are attested to follow common culture, social convention (norm)|customs and manners like supporting short cropped hair, non-entertainment of Brahmanas and observing two varna (Arya and Dasa) social system instead of chatur-varna observed by the Indo-Aryans etc. The Yonakambojesu expression in Ashoka's R.E XIII as well as in the Majjhima Nikaya (43.1.3) powerfully attest very close relations of the Kambojas with the Yavanas. Thus, it is not unusual that the Kambojas have sometimes been indiscriminately included among the Yavanas and addressed as such, in the later Sanskrit literature. According to Dr Buddha Parkash: "Along with the Sakas, the Kambojas had also entered India and spread into whole of North India, especially in Punjab region|Panjab and Uttar Pradesh. Mahabharata contains references to Yavanas and Kambojas having conquered Mathura (12/105/5)....There is also a reference to the Kambojas in the Lion Capitol inscriptions of Saka Satrap (Kshatrapa) Rajuvula found in Mathura " (India and the World, p 154, Dr Buddha Parkash; cf: Ancient India, 1956, p 220, Dr R. K. Mukerjee). Image:Rajuvula.jpg|thumb|175px|Coin of Rajuvula (1st century CE). Mathura was under outlandish people like the Yavanas and Kambojas... who had a special mode of fighting (Manu and Yajnavalkya, Dr K. P. Jayswal). The following verse from Mahabharata composed around the beginning of Christian era strongly attests the Kambojas and Yavanas in control of Mathura. The Mathura Lion Capital discovered in 1896 from Saptarsi mound in the south-eastern part of Mathura city housed in the British Museum, London, contains an epigraph in Kharoshthi characters which refers, among others, to Yuvaraja Kharaosta Kamuio and Aiyasi Kamuia, the chief queen of the Great Satrap (Mahakshatrapa) Rajuvula. After fresh and thorough critical review of Mathura Lion Capital inscriptions, Dr S. Konow has arrived at results and conclusions which are different from the earlier scholars. According to Dr Konow's findings, Rajuvula's chief queen was Aiyasi Kamuia who was the daughter of Yuvaraja Kharaostas, himself also a Kamuia. By rigorous linguistic analysis, Dr Konow has also established that name Kamuia/Kamuio of Lion Capital inscriptions is the Kharoshthi|Kharoshthised form of Sanskrit Kamboja, Kambojaka or Kambuja (Corpus Inscriptionum Indicarum II, Vol II, Part I, p xxxvi and p 36, Dr S. Konow). Thus, there is both literary as well as inscriptional evidence which amply attests the presence of ancient Kambojas in Mathura. Further, the scholars have also identified Yuvaraja Kharaostas of the Mathura Lion Capital inscriptions with Kshatrapa Kharaostas whose coins have been examined by Rapson and Luders. Kshatrapa Kharaostas (Kharoshtha) was son of Arta as is clear from his coins i.e Kshatrapasa pra Kharaostasa Artasa putras. Arta (or Orta) is stated to be brother of king Maues|Moga (or Maues). Image:MauesBuddhaCoin.JPG|thumb|300px|Indian-standard coin of King Moga or Maues. The obverse shows a rejoicing elephant holding a wreath, symbol of victory. The Greek legend reads ??S?? ?OS ??S???O? ??G???? ????? (Great King of Kings Maues). The reverse shows a seated king, or possibly Buddha. Kharoshthi legend: RAJATIRAJASA MAHATASA MOASA (Great King of Kings Maues). Thus, according to Dr Konow and his line of scholars, king Moga, his brother Arta, Yuvaraja Kharaostas (Kharoshtha) Kamuio, and princess Aiyasi Kamuia were all from the Kamuiá or Kamboja/Kambojaka or Kambuja clan. However, some scholars insist that Maues|Moga was of Saka extractions, but there is absolutely no evidence so far to link Moga to Saka ethnicity. Scholars link Moga to the Sakas merely based on his so-called Saka-sounding names like Maues, Maues|Muki or Maues|Mevake which are said to be variants of Scythian name 'Mauekes' (Dr Raychaudhary, DR J. N. Banerjea). This is not a very convincing reasoning to identify him as of Saka extractions. As is well known, during few centuries preceding the Christian era, there had occurred extensive social and cultural admixture among the Kambojas and Yavanas; the Sakas and Pahlavas; and the Kambojas, Sakas, and Pahlavas.... such that their cultures and social customs had become almost identical. The culture of Kambojas was modified as a result of their contacts, first with the Yavanas and later, it went further modification as a result of their contacts with the Sakas and Pahlavas etc (Dr D. C. Sircar, Dr J. L. Kamboj). This extensive social and cultural admixture due to time and space proximity had led to adoption of similar customs, dress mode, language and social manners among the various frontier peoples of north-west. While ruling over middle and lower Indus valley--Drangiana and Archosia--, both the Sakas and Pahlavas were closely associated and no wonder it is not always possible to distinguish between them. The close association of the Sakas and Pahlavas etc in this period is demonstrable from various sources and it is highly probable that the tribes from eastern Iran invading or entering India contained diverse elements including Iranians (Dr J. L. Kamboj, Dr J. N. Banerjea). It is therefore, little more than a convenient nomenclature which labels the princes of the family of Maues as Sakas and those of the family of Vonones as Pahlavas (Dr Rapson, Dr F. W. Thompson). Thus, we see that the identification of Maues as Saka prince is solely a CONJECTURE and is based merely on so-called SAKA-SOUNDING name which is no conclusive evidence at all. If one accepts above argument, then how to explain surname Kamuia used after the names of king Moga's family members? Is Kamuia also attested as a clan name among the ancient Sakas/Scythians anywhere? The answer is no. As a matter-of-fact, there is no unanimity on the ethnicity of king Moga and his family. Image:Maues.jpg|thumb|300px|Greek-standard silver tetradrachm of Maues. The obverse shows Zeus standing with a sceptre. The Greek legend reads ??S?? ?OS ??S???O? ??G???? ????? ((of the) Great King of Kings Maues). The reverse shows Nike (mythology)|Nike standing, holding a wreath. Kharoshthi legend. Taxila mint. Scholars like Dr V. A. Smith say that he was a Parthia|Parthian king (The early History of India, p 242). H. A Rose also agrees with Dr Smith and regards king Maues as an Indo-Parthian king (Glossary of Tribes, Vol I, p 33, H. A. Rose). Others say that he was Saka king. Latest, Dr S. Konow and many scholars like Dr R K. Mukerjee, Dr J. L. Kamboj and others following Dr Konow write that he belonged to the Kambojaka or Kambuja tribe. According to Dr Thomas, the epigraphs of Mathura Lion Capital exhibit a mixture of Saka and Persian language|Persian nomenclature. This tells us that Aiyasi Kamuia and Kharaosta Kamuio were from the Persian/Iranian denominations hence more likely from Kamboja ethnicity.
" The nomenclature of the early Sakas in India shows an admixture of Scythian, Parthia|Parthian and Iranian peoples|Iranian elements..... " (Hist & Culture of Indian People, The Age of Imperial Unity, p 121; Ancient India, 2002, p 416, Dr V. D. Mahajan; Ancient Kamboja, People and the Country, Dr J. L. Kamboj etc). Even the northern Kshatrapas are stated to be of mixed Saka/Persian ethnicities. Dr Thomas: " It would seem probable that the tribes from eastern Iran who had invaded India included diverse elements mingled indistinguishably together, so that, it is not possible to assert that one dynasty was Parthian while another was Saka..." etc (Journal of Royal Asoiatic Society, 1906, p 215). Thus, the ethnic surnames Kamuia/Kamuio used with the names of princess Aiyasi and Yuvaraja Kharaosta (or Kharahostes) of Mathura Lion Capital inscriptions should give more than enough credibility to the view that king Moga and his family belonged to 'Kamuia' or Kamboja/Kambuja clan. It is reasonable to think that the Kamboja clan of king Moga had become some what Scythianised in social customs, culture and mannerism due to extensive exposure to the next-door vast community of Central Asian tribes which had followed Scythian culture. Under such a scenario, it is absolutely not unusual for the Kamboja family of king Maues or Moga to have borne names which may sound somewhat Scythian or mixture of Scythian and Parthia|Parthian. Probably, this is the clue to king Moga's ethnic identity. Therefore, King Maues or Moga and his family were most probably from Kambojan rather than Scythian lineage. There are some European scholars who consider the Kambojas to be a clan of the Sakas. If this view is accepted, it immediately blows off any mist and confusion about true ethnicity of king Moga and his family. But originally, the Kambojas were Aryan not Scythian, in culture. Markendeya Purana Chapter (57.35) lists the Kambojas and Pahlavas among the countries of Udichya division i.e Uttarapatha, but another chapter of the same Markendeya Purana also refers to other settlements of the Kambojas and Pahlavas and locates them in the south-west of India as neighbor to Sindhu, Sauvira and Anarta (north Saurashtra) countries (Markendeya 58.30-32). Brhatsamhita of Varaha Mihira (6th century CE) also locates one Kamboja and Pahlava settlement specifically in the South-west (nairrtyam dizi = south-west) of India as neighbors to Sindhu, Sauvira, Saurashtra and Dravida e.g. nairrtyam dizi dezah Pahlava Kamboja Sindhu Sauvirah/ hemagiri Sindhu Kalaka Raivataka surastra Badara Dravidah/ – (Brhatsamhita 14/17-19). Arthashastra of Barhaspatya (Ed. F. W. Thomas, pp 20-22) refers to the Kamboja as a great country (Mahavishaya) and locates it adjacent to the Dasrana country (southern Malwa), east of Gujarat (Indian Historical Quarterly, XXVI-2, 1950, p 127). Vishnu Dharmottari (I.9.6) also includes the Kambojas in the list of Janapadas of south-west India (Geog. Data in Early Puranas, 1972, p 163, 206). Raajbilaas, a medieval era text also locates a Kamboj settlement in the neighborhood of Kachcha, Sorata or Saurashtra and Gurjara countries of SW India. e.g. sorata gurjara kachcha-kamboja-gauda rukha: – (Raajbilaas 1/122). The Garuda Purana which was composed comparatively late, also locates a Kamboj principality/settlement in the neighborhood of Ashmaka, Pulinda, Jimuta, Narashtra, Lata and Karnata countries, and also specifically informs us that this section of Kambojas were living in southern division of India (dakshina.path.vasinah) e.g. pulinda ashmaka jimuta narrashtara nivasinah: carnata kamboja ghata dakshinapathvasinah: – (Garuda Purana 1/15/13). Interestingly, Agni Purana locates two Kamboja settlements in India itself....... Kambhoja in south-west India and Kamboja in southern parts of India (Ancient Kamboja, People and Country, 1981, p 305). The above post-Christian Sanskrit references abundantly establish the historical fact that in wake of major events of second/first century BCE, some sections of Central Asia|Central Asian Kambojas in alliance with the Sakas and Pahlavas, had spread and settled into western and south-western parts of India. The Kambojas in/around west, south-west India are also attested from inscriptions of king Sahasiva Raya of Sangama Dynasty (1336-1478), kings Harihara & Deva Raya of Narasinga Dynasty (1496-1567), and from the references of king Vishnuvardhana of Hoiyasala Dynasty/Mysore (of 12th c CE). Due to the above cited literary/inscriptional evidence, some historians like Dr Aiyangar, Dr Banerjee etc have located their Kamboja in Sindhu and Gujarat (Ancient India, p 7, S. K. Aiyangar; Public Administration in Ancient India, p 56, P. N. Banerjee). Obviously, their Kamboja refers to the post-Christian settlements of Kambojas in western/or south-western India and is not the original Kamboja of the Sanskrit/Pali literature. Biography of Shankara Acharya based on his religious itineraries refers to Kambhoja located in Saurashtra comprising Girnar, Somnath, Prabhasa and other regions and a Kamboja located in Central Asia adjacent to Daradistan but lying north of Kashmir. This eighth-century reference clearly attests two Kamboja settlements, one of which specifically fixed in Saurashtra [https://www.geocities.com/advaitavedant/shankarabio.htm]. Some historians have also invested western Kshatrapas, especially the Kshahrata Kshatrapas with Kamboja ethnicity (Ancient India, III, pp 94, 125, Dr T. L. Shah). Interestingly, Kambhoja Raja Kathalu is very popular in Andhra traditions. The story deals with militaristic exploits of a fierce and adventuours king of Kambojas. It probably relates to some historical brush the Andhraites might have had with the intruding hordes of Kambojas/Pahlavas around Christian era. The Kamboja hordes of second/first century BCE have left indelible foot prints in the names of mountains, rivers, and some geographical places in western India. The Kamb/Kambuh river and Kamboh/Kambo mountain in Sindh ( Sind, p 44, M. R. Lamrick) remind us of Sanskrit Kamboja. The Kamboi (ancient town/port) in district Patan, Khambhoj in district Anand, Cambay|Kambay (port/town and Gulf)... all in Saurashtra; Kumbhoj/Kumbhoj|Kambhoj (an ancient town) in Kolhapur in Maharashtra; and the Coimbatore|Koimbatore city of Tamilnadu in southern India carry unmistakable footprints of Kambojas. There is also an ancient Kambhoj caste living near Nanded in Maharashtra which could be a dwindling remnant of ancient Kambojas who had settled in SW India around Christian era. A similar analogy can be drawn with the Kamma caste of Andhra Pradesh which had a military past during medieval times. The people of this caste are known for their enterprising and boisterous nature. Rajyapala, Narayanapala, Nayapala, Dharamapala and Gaudapati, also known as Kunjarghatavarshayan, are the known Kamboja kings who ruled in north-east Bengal. Kamboja rule in north-east Bengal is attested from Dinajpore Pillar Inscription as well as from Irda Tamrapatra inscriptio found in Irda, District Balasor, Orissa, in 1931 (Edited/published by Dr N. G. Majumdar, 1934). Dinajpore Pillar inscription refers to a Kamboja king who is described as Kambojanvayjen Gaudapati.. i.e. the lord of Gauda born in a Kamboja family (Indian Antiquary, I, 1872, pp 127ff, 195ff, 227 ff; Journal of Royal Society of Bengal, II, 1911, pp 615-19). In the inscription, this Kamboja king is addressed as Kunjarghataversheyan, which may be his nick-name. Jaganathaparkasha composed by Pandit Sura Misra in honor of Jagana Natha born in Kamboja family (Kamboja.kulavatansah.shri. Jagananatha iti prasidhah) refers to him as a famous king ruling in Bengal in 16th century (Notices of Sanskrit MSS, V, no 1790). One section of north-western Kambojas appears to have reached Sri Lanka via Gujarat/Saurashtra, several centuries prior to Christian era, thus contributing to the colonization of that island and influencing the social, cultural and economical lives of its people. This is evident from six or seven ancient cave inscriptions found in Anuradhapura which strongly attest the existence of one Kamboja Sangha (Goshatha) (Gota-Kabojhyana.......Archaological Survey of Ceylon, Inscription Register No 316) and Grand Kamboja Guilds (Kabojhiya-Maha. Pugiyana.....op. cit. Inscription Register No 1118) in ancient Sinhala. These inscriptions are said to belong to third century BCE (Dr S. Paranavitana). The Sihalavatthu, a Pali|Pali text of about the fourth century, also attests a group of people called the Kambojas in Rohana. The third story of this text, called Metteyya-vatthu, reveals that the Elder named Maleyya was residing in Kamboja-gama, in the province (Janapada) of Rohana on the Island of Tambapanni (Sri Lanka). Sasanvamsa attests one Bhikshu Tamalinda thera, son of Kamboja, living in ancient Sinhala. It also attests a Kamboja king Srihamsyia, who came from Kamboja and took possession of Ratanapura in south-west Sinhala (Sasanavamsa, (P.T.S), p 40, 100; Some Kshatriya Tribes, p 249/50, Dr Law). The second most referenced ethnic group following the Aryan Kambojas in the ancient cave inscriptions of Anuradhapura are the (Dravidian race|Dravidian) Damedas or Tamils. Term Dameda occurs in four inscriptions. Term Mileka (Mlechcha) referring to the Indigenous peoples|Aborigines of the island i.e the Veddas, occurs twice. Other three terms Muridi (=Murinda? ), Meraya (Maurya?) and Jhavaka each occurs only once. There is no reference to the name Sinhala, in any of these ancient inscriptions. The first ever reference to Sinhala is noted in 4th century Dipavamsa. This proves that the Sinhala identity for the majority Sinhlese speaking Aryan population had evolved much later, down the road. The above inscriptional and literary evidence shows that the Kamboja colonists from north-west had formed an important and pre-dominant section of ancient Sinhala society, perhaps from several centuries prior to Christian era. Therefore, they must have been the first Aryan colonists to have reached the island. Mahavamsa traditions reveal that Vijay Simha and his 700 companions, the supposed ancestors of Sinhalese Aryan population, had migrated from some Simhapura country located in India proper (Mahavamsa, 6/34). Mahabharata attests one Sinhapura principality located in north-west of India. This Sinhapura figures prominently in Arjuna's Digvijay of north-west countries. It is stated to be located contiguous to Ursa (modern Hazara, in Kashmir). After the Sinhapura, the Epic makes reference to Bahlikas (Punjab region|Panjab? or Bactrians? ), Daradas and Kambojas, thus showing that the Sinhapura of Mahabharata was located in the north-west adjacent to Kambojas and Daradas of Upper Indus (See: MBH 2/27/18-22) . Chetiya Jataka also locates one Simhapura in the west (Jataka III, p 275). Hiun Tsang, seventh century Chinese visitor also attests one Simhapura (Sang-ho-pu-lo) on east bank of river Indus about 115 miles east of Taxila, which localizes it in upper doab of Jhelum/Chenab (Ref: Hiun Tsang, Buddhist Records of the Western World, Vol. I. Trans. Samuel Beal, 1906, pp 142-150). Scholars have located this Sinhapura in upper Salt Range, north-west of Panjab (Struggle of Empire, p 33, Classical Age, p 132). Sinhala, as a personal name is also attested from two Kharoshthi inscriptions found from Loriyan Tangai and Taxila|Taksashila in ancient Gandhara (Kharoshthi Insc., pp 87, 110, Dr. Konow). The appellative terms Gamika (=Gamini=Gramini) and Parumaka (=Pramukha) and the corporational terms Puga (=Guild/Sangha) and Gote (=Goshati=corporation) etc have been used specifically in reference to Kambojas in the ancient inscriptions of Sinhala. As attested by Kautiliya's Arthashastra, these republican/corporational terms were applied to political, military and commercial Sanghas or Guilds of the Kambojas of Uttarapatha around 4th c BCE. Thus, this evidence suggests that Vijay Simha and his 700 companions, the ancestors of the ancient Sinhalas may have been from the Kambojan/Gandharan trade group. The 'shaved-headed tradition' about Vijay and his companions has been referred to in the Mahavamsa. This also alludes to their close connections with the north-west and especially with the shaved-headed Kambojan group. The most famous and only known locale for lapis lazuli since ancient times was in Badakshan in north Afghanistan which has been mined for over 6000 years. The Badakshan province undoubtedly formed a part of ancient Kamboja as we have already proved above. Archeological finds of lapis lazuli (of Badakshan type) from Sri Lanka conclusively connect it to Badakshan in Afghanistan, the home of lapis lazuli. Numerous coins, beads and the intaglios belonging to Bactria/Afghanistan have also been discovered in Sri Lanka. Apart from lapis lazuli, coins and intaglios, the contacts between Sri Lanka and the Kamboja/Gandhara/Bacteria region are further revealed by other articles of archaeological evidence from recent excavations at various sites. A fragment of a Gandhara Buddha statute in schist, (yet unpublished), was unearthed from the excavations at Jetavanarama in Anuradhapura. All these archaeological finds conclusively establish a very close relationship between Sri Lanka and the north-west communities, especially, the Kamboja|Kambojans/Gandhara|Gandharans of Afghanistan/Central Asia. In the Amarakosha (11.6.42; 111.9.78), a Sarthavaha is described as the leader of merchants who have invested an equal amount of capital and carried on trade with outside markets and are traveling in a caravan. It is likely that Vijay Simha, the ancestor of the Sinhalese was the earliest one such Sarthavaha from the Simhapura of the Kamboja/Gandhara group in North-west India. According to Mahavamsa traditions, Vijay and his 700 companions had landed in Sri Lanka in 543 (or 483?) BCE, on the day of Buddha's heavenly departure. This may actually refer to Vijay's commercial visit to Sri Lanka for trade with the Daemedas/Tamils in Sinhala and then permanently settling there with his 700 merchant associates. The Daemeda/Tamil people|Tamil groups were already settled there with whom the trade was routinely carried on from the north-west following ancient Kamboja-Dvaravati Route|Kamboja Dvaravati Caravan route and then via the west-coast sea-route starting from Bharukachcha (Bhroach) in Gujarat. The north-west coast of Sinhala was famous for its fine variety of motis/gems and was known as Motimannar. The south-east coast was also known for its precious stones. The merchants from north-west Kamboja had an allurement for these specific products. It is also significant that early Buddhist literary sources from north India refer to the northerners as being involved in trade in horses (Vinaya Pitaka, III, 6; Játaka, Vol II, 287, Fausboll). Evidence exists that horse merchants from Kamboja were in active trade as far as Ceylone. This trade had been going on with eastern, western and southern India as late as medieval ages. King Devapala (810-850 CE) of Bengal, King Vishnuvardhana of Hoysala (1106 - 1152 CE) of Mysore and king Vallabhadeva of Pandya kingdom (12th century CE), located in extreme southern tip of India, had powerful fleets of Kamboja horses in their cavalry. Dr Don Martino observes: The traders from north-west Kamboja had been conducting trade in horses with Sri Lanka following west coast of India since remote antiquity (Epigraphia Zeylanka, Vol II, No 13, p 76). Dr E. Muller also writes: "...(with time) the Kambojas had adopted the Mussalman creed and used to trade all along the west coast of India from Persian Gulf down to Sri Lanka |Ceylone and probably further-east..." (Journal of Royal Asiatic Societry, XV, p 171, E. Muller). 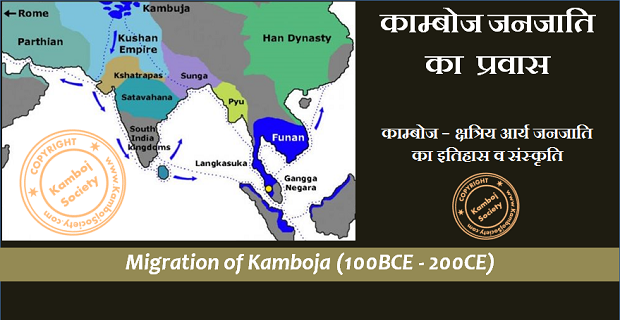 More evidence exists which points to closer links of north-west Kambojas/Gandharas with the ancient Sinhalese. Some ambitious Kamboja families from Gujarat/Saurashtra or those from Sri Lanka|Sinhala appear to have ventured into Indo-China around third or fourth century CE, originally as merchants/traders, later joined by some Kshatriya Kamboja chieftain. They managed to found a small Kamboja colony north of Funan, which later grew into powerful Kamboja empire under the Varman kings. If the European traders, located thousands of miles away could do it in eighteenth century in India, the Kamboja adventurers from Gujarat/Surastra or Sri Lanka could have done it in fifth century in nearby Indo-China too. The Kambojas as traders and as ethnic community were already flourishing in Sri Lanka at this time as is evident from the archaeological evidence presented above. With one little step forward, they were in Indo-China. The ruling family of Varman kings of Cambodia proudly trace their lineage to the Kambojas|Kambujas or Kambojas. King Kamboja|Kambu (Sanskrit Kamboj), the legendary patriarch of Kambuja (Kamboja) ruling family of Cambodia was, to all probability, a warrior/scholar Kamboja chieftain from Sinhala or else from Gujarat. The tradition among north-Indian Kambojas lends adequate credibility to this view. Several noted scholars like Dr Buddha Parkash, Dr P. C. Bagchi, Dr B. R. Chatterjee, J. Fergussan, Dr R. K. Mukerjee, Bombay Gezetteer, Dr J. L. Kamboj and several others have accepted a direct historical and political links between the Indian Kambojas and Cambodia|Kambodia. G. Coedes, an authority on ancient Cambodian history, has also accepted the probability of this connection (Indianized States of South-East Asia, 1964, p 47). One school of scholars including Dr V. A. Smith, Dr Joveau Dubreuil, Dr V. Venkayya, Dr B. L. Rice, G. Coedes etc is convinced that the Pallava rulers of Kanchi/Southern India were a section from the Iranian peoples|Iranian Pahlavas. The Pahlavas were a tribe closely allied to the Kambojas. Thus, some adventurous families from both the Pahlavas and the Kambojas who are attested to have settled in south-west India in post-Christian era (See: Brhat Samhita: 14/17-19; Markendeya Purana 58.30-32) may indeed have founded the Pallava dynasty of Kanchi and the Kambuja dynasty of Cambodia respectively.